Four more villagers have been killed in Bangolan, Babessi Sub-division, Ngoketunjia Division, in connection to a bloody crisis that has since rocked the reign of Fon Chafah XI. It was reported that Jacob Pefeh, Emmanuel Ndifor, Forkong Peter and Tata Daniel were recently attacked in their homes and murdered in cold blood. The murder, The Post learnt, is linked to the chieftaincy crisis rocking the village of Bangolan. The atmosphere in the village is said to have become tense when rumours spread that the gang which killed those mentioned above had targeted Fon Chafah and 28 others. The Post learnt that the first name on the list of those blacklisted is Fon Chafah Isaah. Matters worsened when supporters of Salim Mbipefah, who died mysteriously after being released from Ndop Prison, also declared war on Fon Chafah. Mbipefah’s supporters say Fon Chafah had a hand in the deceased’s death since he insisted that an autopsy be conducted on the corpse to determine the cause. Salim Mbipefah and his supporters had been arrested and detained for trying to overthrow Fon Chafah. Mbipefah’s supporters were detained at Ndop Prison for reportedly exhuming a dead pig which had been buried behind the Bangolan palace as a ritual to kill Fon Chafah. Supporters of Fon Chafah reportedly caught the elders, whose names we were unable to obtain, exhuming the carcass of the pig. It was reported that the elders attempted to escape. Meanwhile, allegations are rife that women from Baba 1 married to Bangolan men are being chased from the village because Fon Chafah’s mother hails from Baba 1 palace. Fon Chafah’s supporters, however, have denied the threats. According to them, all the rituals performed by the detractors to have Fon Chafah dead have failed. Rumours even have it that Fon Chafah’s image was put in a calabash and sent to Nigeria for him to be killed but it did not work. 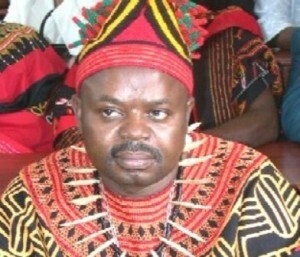 Woe struck Bangolan when some of the subjects of Fon Chafah clamoured for his ouster on grounds that he had embraced Christianity and resorted to the destruction of the fondom’s cultural and traditional artifacts.